Once in a blue moon there comes an outstanding and fiendishly clever psychic routine, such as "The Astounding Prediction Reading" by Dr. A. The effect is that the medium predicts three questions that the subject will write, with detailed data, before the spectator actually writes them! It is one of the most convincing mental routines to date. Diabolically clever is this bombshell prediction and reading that will knock the spectator off her feet with its accuracy and depth. Dr. A's method overcomes the former handicaps of the private reader, by presenting "proof" of the written prediction. The facts presented to the client are not general situations, but actual, detailed data. Not one, but many clinchers are incorporated in this master method. Every step of the "Prediction Reading" is explained in complete detail. Only ordinary household properties are used, and the entire presentation can be put into effect with a minimum of practice. This is strictly a superior "private reading" method for giving individual readings, and is not adaptable to platform presentation. We sincerely believe Dr. A has reached a new zenith in the perfection of a truly convincing method. Here is the complete, detailed exposé. A new, simple easy-to-do billet switch for the private reader, with a real clincher. Dr. A adds his usual subtle and convincing touch to this unique method of switching billets. This billet switch is not in widespread use, because it has been a closely guarded secret among the profession. It is a perfect, easy-to-do switch, and properly executed, defies detection. 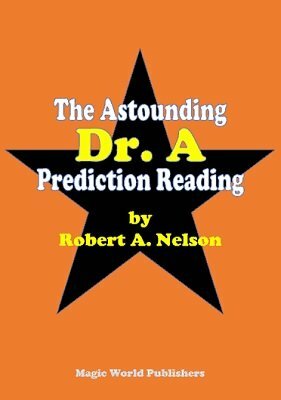 It is now included in this revised edition of the Astounding Dr. A Prediction as a special bonus. Are you a Nelson collector? This manuscript was listed as No. 623 in the Nelson Enterprises catalog . 1st edition 1955, PDF 18 pages.